Update: details of AGM added below. All events are subject to confirmation. Saturday 28th April, 12pm – Opening of DERA Community Garden, Donaghmede DCC Park. 31st May 2018, 8pm – DERA Annual General Meeting, St. Kevin’s School. All welcome. Thursday 14th June to Saturday 16th June – DERA Annual Bucket Collection in Donaghmede Shopping Centre. Thursday 19th July, 6.30pm – Garda Band Gala Concert in Donaghmede Shopping Centre, courtesy of the Centre Management and Coolock Garda Station. Saturday 21st July & Sunday 22nd July – Family Fun Days, Donaghmede DCC Park (subject to permit). Wednesday 25th July – Senior Citizens Mystery Tour. This is a ticket only event, and space is limited: early booking is advised. Saturday 22nd September, 8pm – Community Gala Dinner Dance, Hilton Airport Hotel (cost to be confirmed). The opening of the DERA Community Memorial Garden in Donaghmede DCC Park in association with Dublin City Council is planned for Saturday 28th April at 12pm. DERA is pleased to confirm the formal Opening Ceremony by the Lord Mayor of Dublin Cllr. Mícheál Mac Donncha. Fr. Gerry Corcoran, PP Holy Trinity Parish, will impart a Blessing at the ceremony. All residents are invited to attend. We are pleased to inform residents that Dublin City Council is arranging a Hallowe’en Fireworks Display in Donaghmede Park on the evening of Tuesday 31st October 2017. The display will be staged by a professional pyrotechnics company engaged by Dublin City Council, and will take place at approximately 6.00pm. There will be music from 5.30pm in the lead-up to the fireworks display itself. Update: We’ve been informed that the Lord Mayor of Dublin Cllr Mícheál MacDonncha will attend the event. 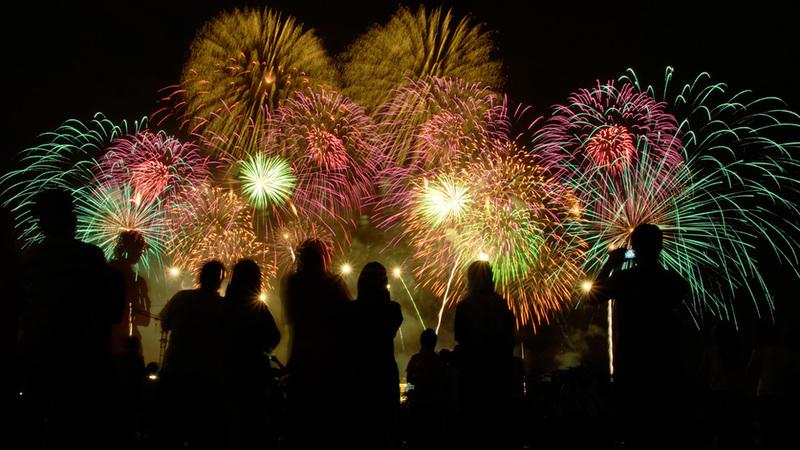 The fireworks display is expected to begin at 6.00pm sharp – be there early! Work on the Community Garden in Donaghmede Park has continued over the summer, in cooperation with Dublin City Council and with generous support from local businesses. 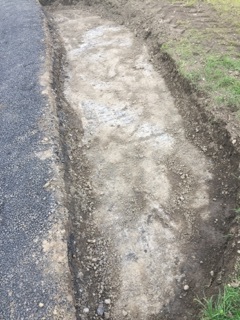 Our picture shows the foundation for one of the seats; at the time of writing, the seats themselves have been installed. The official opening is getting closer, watch this space! 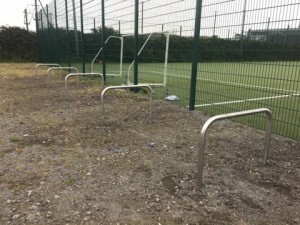 The bicycle racks mentioned in a previous post have now been installed outside the all-weather pitch, which will help protect the surface from accidental damage. Unfortunately, litter and dog fouling continue to cause problems; we remind residents to take away empty drinks bottles and other litter, and to keep dogs off the all-weather pitch. The pitch is a valuable resource for the community, and it’s in everyone’s interest to protect it and those using it.